Armed with her MBA degree, Gabriella Martin is ready to face the world. She’s gained valuable experience the past year as the interim CFO of her parents’ highly successful Choose Me! Christian marriage ministry, but is that what she’s destined to do the rest of her career? While she considers her options, Gabriella returns home to the beautiful Shenandoah Valley of her native Virginia. What she doesn’t count on is running into her childhood friend Harley nearly everywhere she goes, especially since he suddenly seems more ruggedly handsome and irresistibly charming than ever. A master woodworker and furniture builder, Harley Goodwin has always been “just friends” with Gabriella Martin from the time they were kids. While she’s home in Meadowvale trying to figure out her future direction, Harley prays he can finally win her heart. He might not have a fancy college degree, but he’s built a solid, flourishing career and is financially stable. As determined as Harley is to earn Gabriella’s love, she seems to suffer the misconception that he’s dated every other eligible girl in town, and she’s the last woman standing. During the long and hazy days of summer, can Harley convince this stubborn beauty she’s the only woman he’s ever loved and that Gabriella needs to stay in Meadowvale permanently and make a life, home, and family with him? 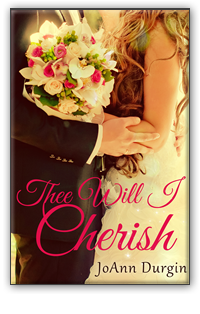 Thee Will I Cherish is the first in the new three-book Treasured Vow Series from USA Today Bestselling Author, JoAnn Durgin, featuring the stories of Gabriella, Matt, and Aubrey Martin. Although they’re the children of renowned Christian marriage experts, these three siblings need a little guidance from the Lord as well as their friends and family to help them navigate relationships and love.